Norman Bel Geddes was a mega-designer of the 1930s, and brought a streamlined style to all manner of industrial objects. These ranged from radios and cars to houses and theatre sets. 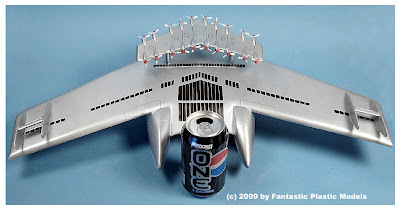 But SMN reckons his crowning glory was the ‘Airliner Number 4’, an outrageous piece of fantasy that had multi-decks, an on-board gym, hangars for smaller planes to take off and land - and Bel Geddes even included plans for a full in-flight orchestra! The AN4 was never built, but thanks to the excellent Fantastic Plastic company, you can now bring a piece of ‘the way the future was’ onto the work bench. The Bel Geddes Airliner is a big hunk of kit - even at the small scale of 1:288, the wings still span some 560 mm (22 in). It’s not cheap, but for any retro-lover AN4 will make a fine investment, and look great with other 1930s-era items. 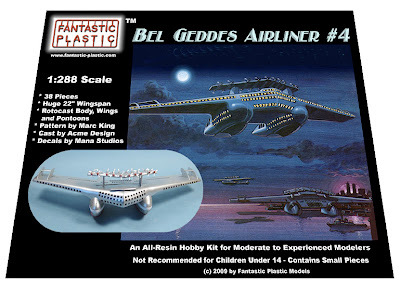 Check out the Norman Bel Geddes Airliner Number 4 at Fantastic Plastic here.